Certification may be the next best step for your career — consider the benefit of knowing how to work with any number of clients with medical conditions. Cancer survivors, diabetic or pre-diabetic, seniors, arthritis, and other conditions benefit from exercise. Health insurance providers encourage self-care in conjunction with medical services, and there's a growing need for health and fitness professionals to offer exercise therapy and wellness as part of the continuum of care. Health and fitness professionals who are currently certified and have experience in the field, but would like to expand their client base to include medically-based patients and interact with physicians and physical therapists regarding workplace-injured workers who would benefit from long-term exercise programs. Working Well combines the best of clinical exercise instruction with knowledge of worker's compensation claims information to help prevent injuries in workers, and get injured workers back to work SOONER, and while costing their employers less in health care costs. The evolution of post-rehabilitative exercise marks the beginning of the integration of exercise with medicine. 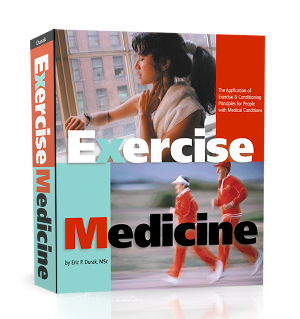 Our comprehensive course — Exercise Medicine, is a thorough, well researched and documented publication that details exercise programming for over 25 medical conditions. This course incorporates the best of strength training, exercise progression, exercise physiology, and blends them with the basics of physical assessment and laboratory testing. Progressive exercise used in a medical situation will show improvements in blood lab values independent of medical procedures alone. According to industry leader Jason Conviser, PhD — there is not one cardiovascular illness or behavioral condition that does not benefit from a properly prescribed exercise program. Exercise Medicine allows fitness professionals to learn the elements of medicine and begin to apply exercise principles with referred patients. MedHealthFit saw the need to combine aspects of clinical exercise, worker’s compensation and the health and fitness industry. Often employees who are injured on the job are referred to a worker's compensation physician, who may prescribe a drug and in some instances, refer to physical therapy. Physical fitness is rarely assessed. Working Well looks at the big picture and considers the entire physical well being of an employee, not just the area of injury. The research is clear – those who are fit are more productive, have fewer accidents and in general are more productive employees. Working Well incorporates on-the-job-exercise and stretching programs that reduce the likelihood of injuries. Working Well has a direct relationship to specific reimbursement for these unique fitness programs. The Working Well Program is geared for health professionals that would like to contract with manufacturing and labor companies to promote exercise at their facilities. The program spells out information regarding return to work restrictions, physician recommendations and other aspects of job performance which exercise may play an important role. Part of the Working Well education module package are regular information video updates from the worker's compensation field.